Six paintings in this series now, amazing! 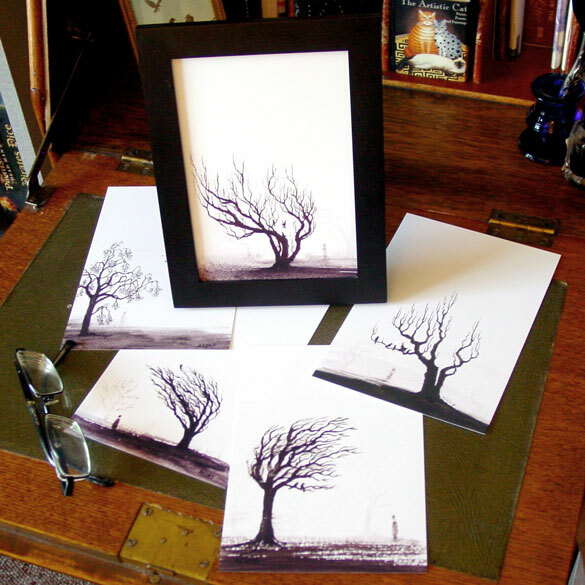 All of the previous ones are in their new homes, but there’s a print set that will bring them all to you. 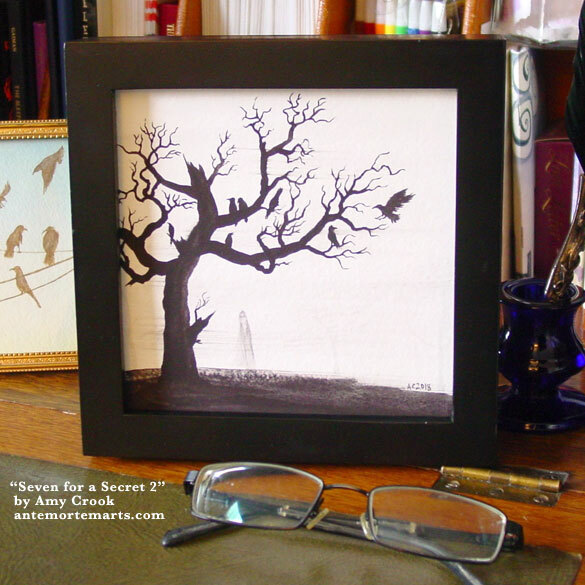 Or, of course, you can take this one home and start your own collection of crows. 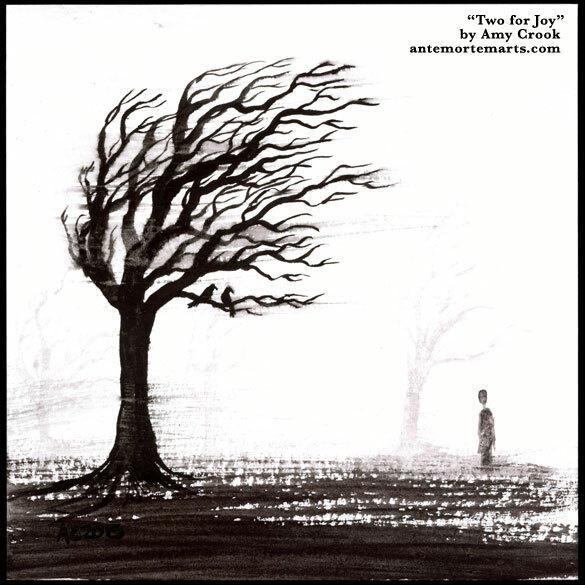 The figure in this one is particularly eerie, and the tree is beautifully bent by a wind you can’t see but can only imagine. 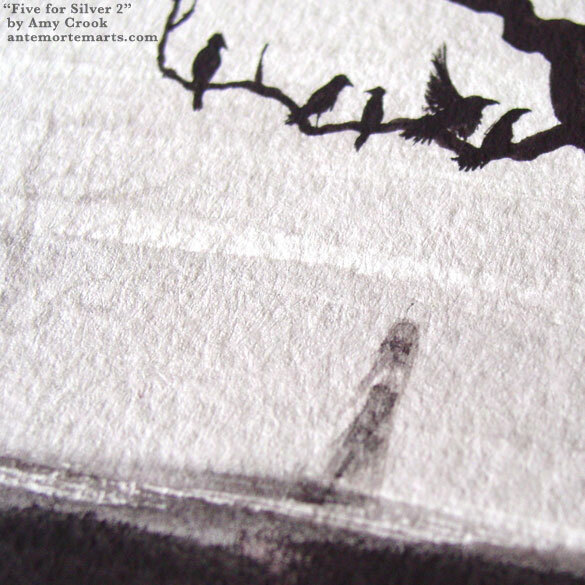 The crows are weathering the mist with equanimity, waiting to ride the breezes off to wherever they roost. 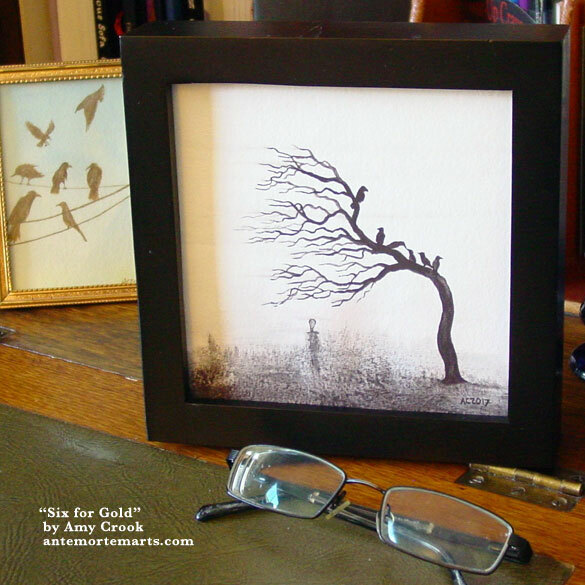 Above, you can see the eerie little figure waiting beneath the wind-twisted tree. 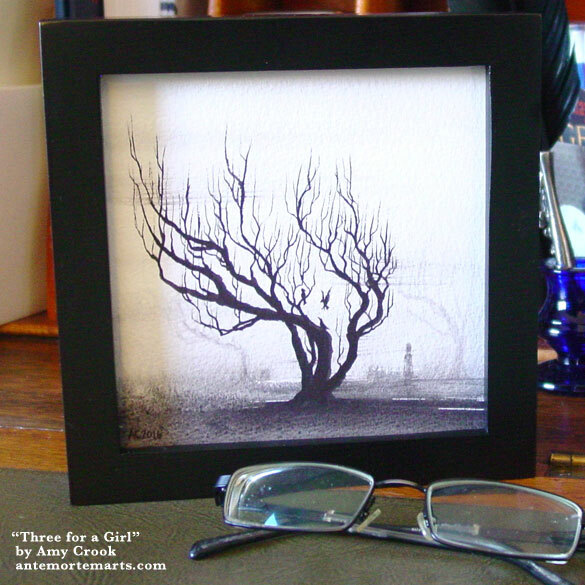 Below, this painting lurks in its frame, a moody little scene just waiting for a wall. 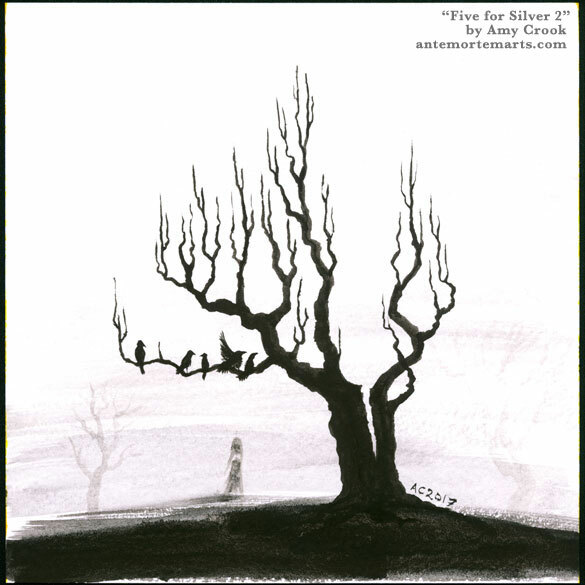 Part five of the eerily monochrome Counting Crows series, we’ve moved along in the rhyme to a whole roost of crows and a bit of silver. Our ghostly figure this time has a distinctly skeletal appearance, and the crows are all arrayed above her in a perfect murder. 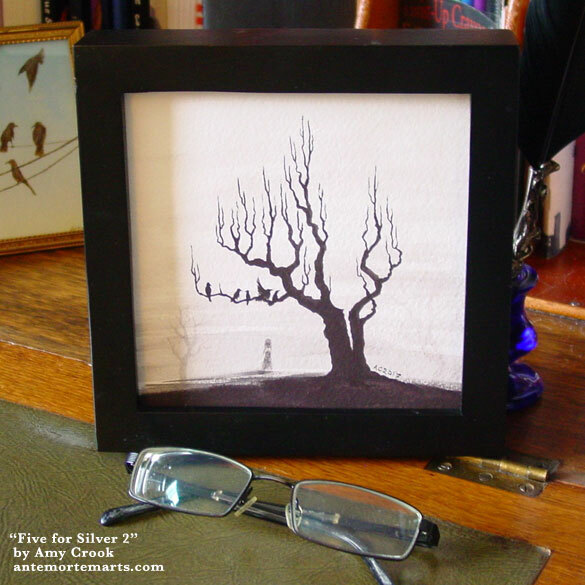 The lightning-split tree reaches up through the mist toward what little light has filtered down on this foggy day. It’s fascinating how fog can reduce the entire world to just you and things you can barely see, isn’t it? 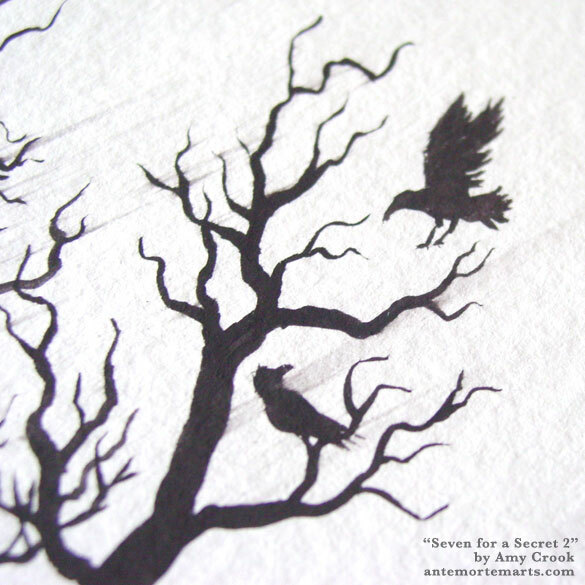 Above, you can see the titular crows arrayed above the faded figure in all her eerie glory. 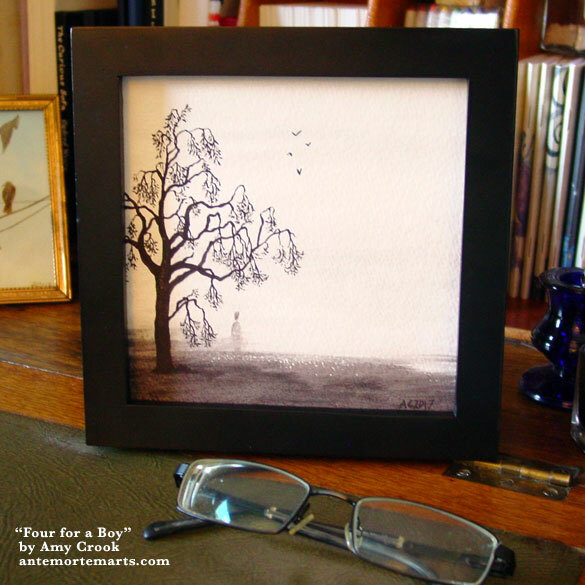 Below, this painting roosts in a frame, waiting to fly to its new home. Mist obscures everything in this painting but the outline of a gnarled, drooping tree, branches bare in winter with just the tiniest hint of buds at their ends. 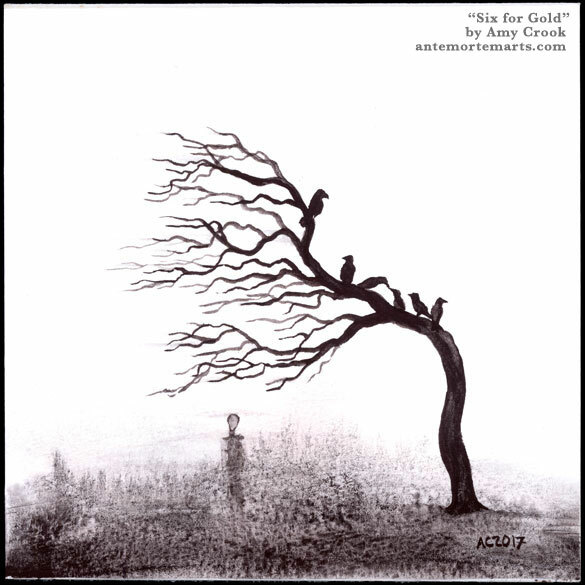 Four black birds approach through the fog, and a figure all but dissolves into mist himself. 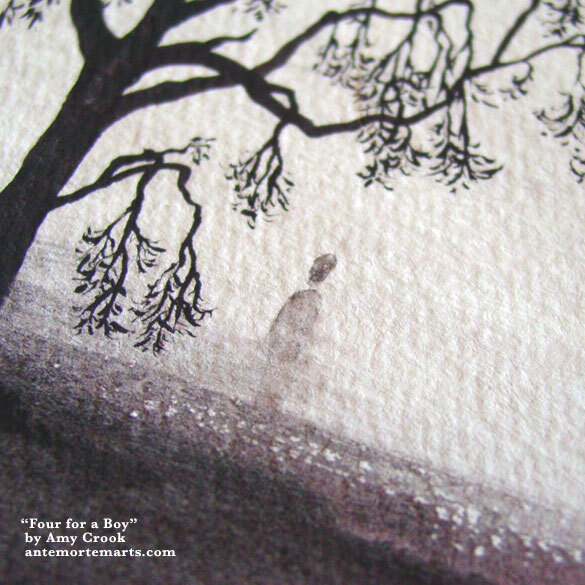 Is it foggier than it looks, or is the figure merely a trick of the eye? 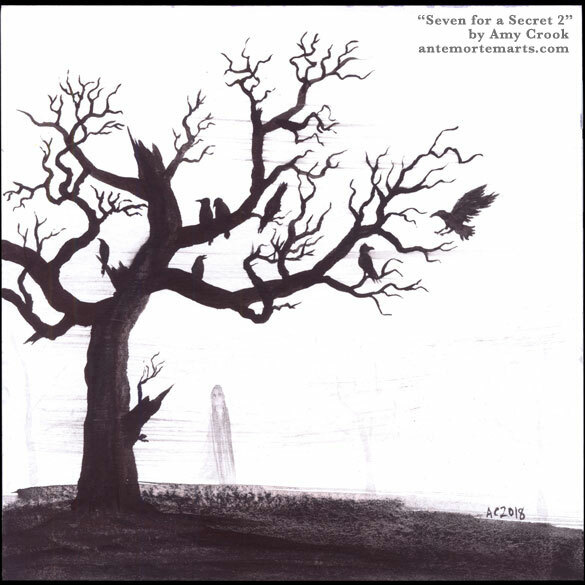 This fourth installment of Counting Crows would make a lovely, creepy addition to your home, something to contemplate when the sun has burned away the mists of the day. 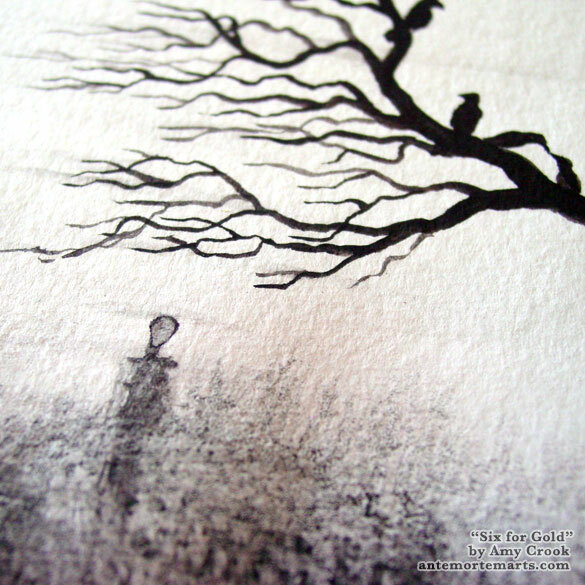 Above, you can see the eerie figure staring out from the mists, surrounded by the tree’s bare branches. 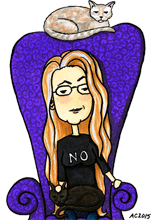 Below, the piece is safely in a frame, just waiting to find the right house to haunt. 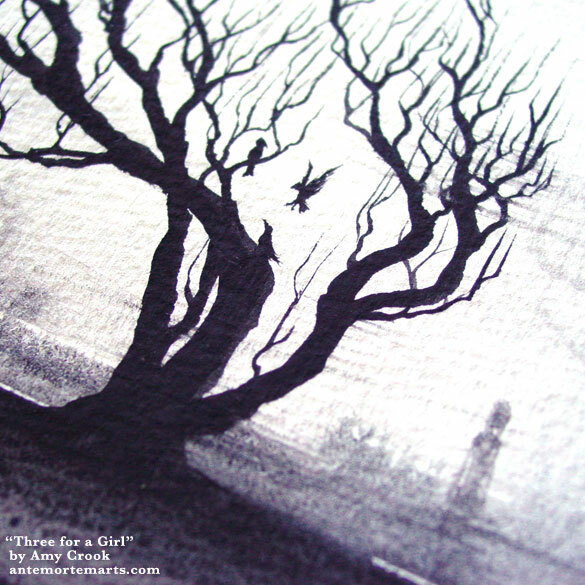 A third installment to one of my favorite series of last year, Three for a Girl continues the Counting Crows theme with another eerie tree and ghostly figure. 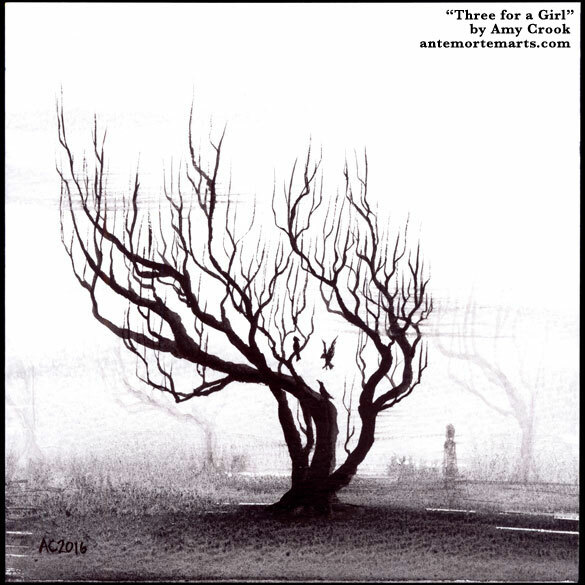 The titular girl is almost lost in the mists, fog drifting through and obscuring everything but the tree and its trio of visitors. 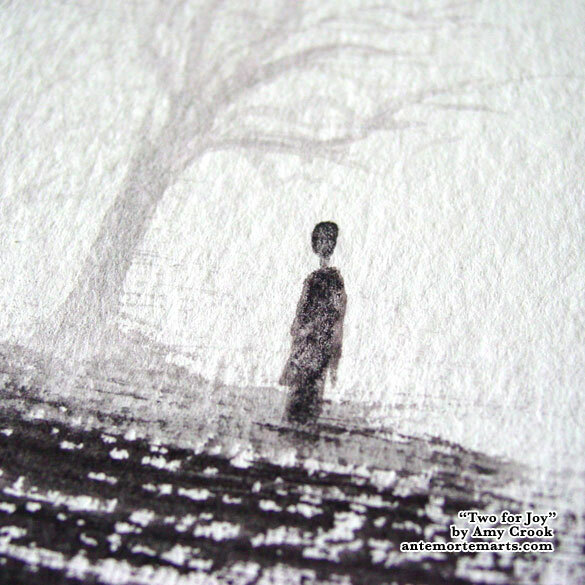 Above, you can see how the off-black paint granulates into beautifully textured mist, pigment pooling in the hollows of the watercolor paper. 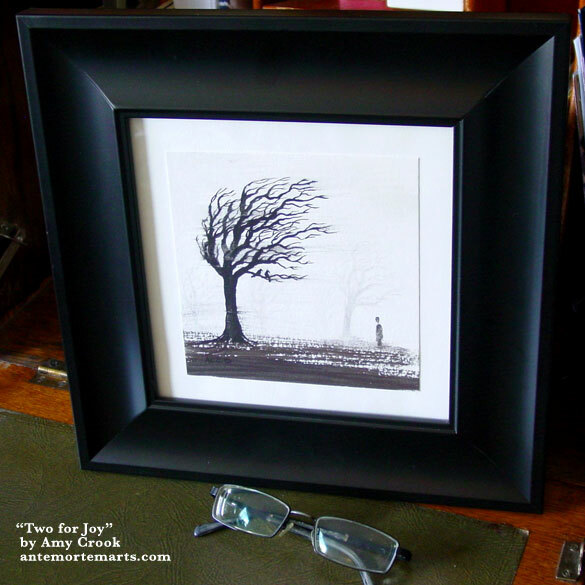 Below, the painting is waiting in a frame, a season and a mood in one small, eerie package.